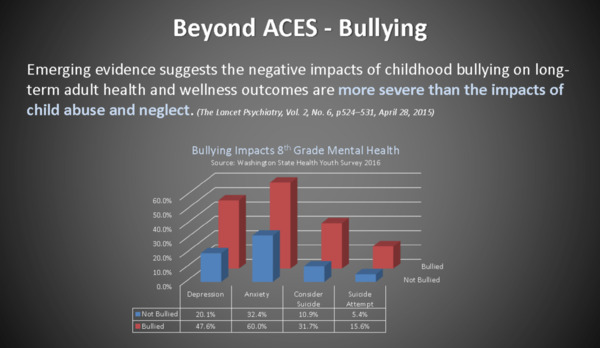 Although ACEs refer to the 10 experiences in the ACE Study, there is a strong relationship between peer victimization and ACE Score. Teicher, Samson, Sheu, Polcari, & McGreenery (2010) found equivalent effects between parental verbal and peer verbal abuse on neurobiology. This led to the development of the MACE instrument (Teicher & Parigger, 2015), which builds on ACEs, but does not include the family dysfunction elements. The MACEs are: physical, sexual, verbal and non-verbal emotional abuse; physical and emotional neglect; peer physical and verbal victimization; and witnessing abuse of a sibling and witnessing intimate partner violence. Sansen (2015) and I (forthcoming) have both found a very strong relationship between intrafamilial MACEs and both peer verbal and physical victimization, in other words, child abuse and neglect predicts peer victimization. I am unaware of research that zeros in on either ACE/MACE and being a perpetrator or ACE/MACE and victim/bully cycles. From my ACES for Educators presentation. 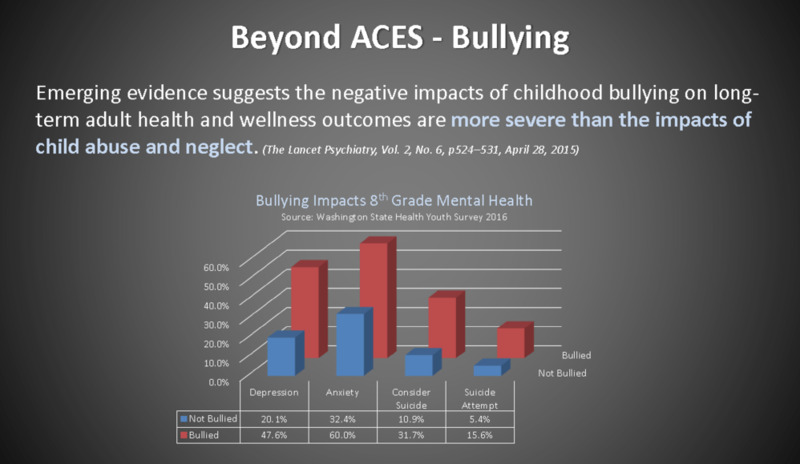 A look at the relationship between the experience of bullying and depression, anxiety, considering suicide and attempting suicide from Washington State Healthy Youth survey data (2016). The World Health Organization (WHO) adopted [and expanded] upon the US CDC/Kaiser...ACE screening tool, to cover two groups of ACEs: Adverse Childhood Experiences and Adverse Community Experiences, in the "WHO ACE International Questionnaire"--which was previously available on the WHO website in over 100 languages. WHO used it in their 2013 assessment of the world's healthiest children (the USA ranked only 25th in that survey). June, it may be helpful to make sure that folks understand that the original ACE study focused on 10 specific types of experiences and was certainly not all inclusive. When we train community partners we try to focus on the fact that "trauma" experience is unique to the individual. It includes any event or experience that overwhelms a person's internal resources (resiliency) and leaves them feeling threatened, helpless, or powerless. Bullying would certainly fit in that category. The resources at the National Child Traumatic Stress Network on Bullying may be helpful in making those connections. They specifically call out Bullying as a type of traumatic experience.